~ Read the Log of "Ithaka"
Click on pictures to enlarge. More photos - Interior and exterior. Follow these links to material lists for the structure in aluminum and wood, a stability curve or a list of drawings for this design. 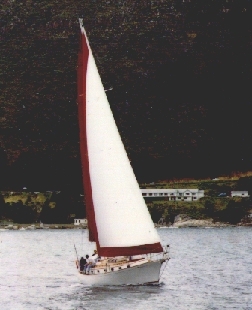 Comments by Rod Turner-Smith, owner of "Sheer Tenacity"
Justin, a lot earlier in our travels, you asked if I felt that the Shearwater was the ideal cruising boat. We have now done just over 4000nm in "Sheer Tenacity" since we left Cape Town last month, and have had time to assess her performance , and time to learn how best to trim and sail her. The answer is unequivically YES!! She is an absolute joy, and a real passage maker! Not only is she good on all points of sail, but she is naturally fast, spacious, and better ventilated than any other boat I know. She is also a real "looker", and commented upon wherever you go! A great combination of classical elegance, and efficient yacht design. Her reputation preceeds her, and people from all over the world recognise them, and respect them. Gerfied and Dudley certainly hit the jackpot with this boat, and I cannot believe that only about 25 of each size were built, and.. that we are lucky enough to own one!